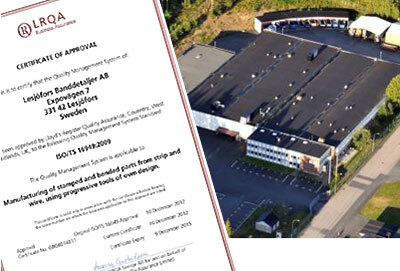 14/03/2013 Seven companies in the Lesjöfors group are now certified to ISO/TS16949, the automotive industry’s quality standard. This automotive-specific quality management system applies to design, development and production of automotive products at Lesjöfors, focusing on defect prevention and continual improvement. Lesjöfors Banddetaljer in Värnamo, Sweden is the latest company in the Lesjöfors group to achieve certification, having worked for over a year to ensure the highest quality and service throughout the production chain. “Being certified not only means producing the best possible product quality but also includes the introduction of highly efficient working methods, e.g. improvement measures and production optimisation,” says Jakob Lindquist, MD of Lesjöfors Banddetaljer in Värnamo. The certification project involved the entire staff in Värnamo and has helped to streamline both processes and organisation. The success has been instant. “We are already seeing a fantastic development in terms of inflow of new business. Many of our new customers are companies within the automotive industry in Europe who demand subcontractors with ISO/TS 16949. With this certification, we have sharpened our offering and have advanced our positions further,” says Jakob Lindquist. "We are growing and improving our offer further"
Lesjöfors acquires German spring manufacturer S & P Federnwerk KG. © 2019 Kilen Springs. Alle Rechte vorbehalten.